One of the most common criticisms against Microsoft’s mobile platform was the lack of quality apps for its modern Windows ecosystem. 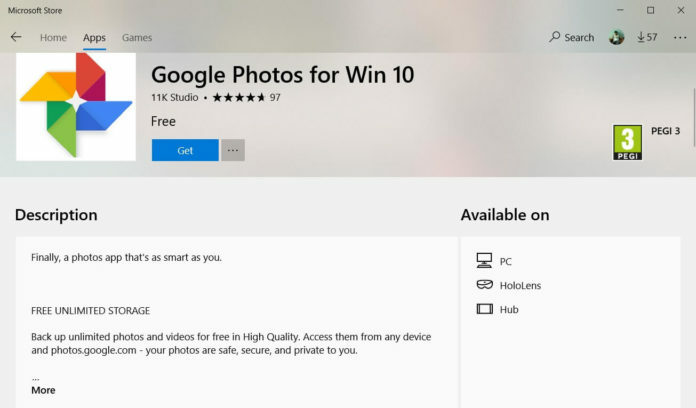 Google is not interested in building UWP apps for Windows 10 devices and the absence in Windows Store is a living proof that the search engine giant is still not interested in Microsoft’s platform. Microsoft is fully committed to Progressive Web Apps (PWA) and we are hopeful that the developers will soon port their web apps to Windows 10. A third-party developer has published seven Google web apps to the Store. 1K Studios has published apps like YouTube Gaming, Photos, Maps, Drive, Docs, Sheets, and Slides. It’s worth noting that Maps and YouTube Gaming apps would run on Windows 10 Mobile devices as well. What’s more important to know is that the apps would offer the same experience as the website but the app might be a better option for some users. A PWA is merely a website that has been coded in such a way that it can also appear as a standalone app and can be installed from the app store on Android and Windows 10. Speaking of the Google Photos app, it lets you view and manage the photos stored on Google Drive. It also has the option to let you view and remove your comments and messages on shared photos. Google has also included Google Assistant support to get an enhanced image storing experience. There’s a chance that Google would pull these apps if they fail to meet Google’s guidelines. For the last 3+ years, I have not missed or see a single need for any Google’s services on my windows 10 PC, Laptop, SP3 or 950XL Phone. I applaud the 3rd party developer’s efforts.